Ready To Work covers notable highlights of the College of Charleston School of Business including the accomplishments and accolades of our distinguished students, alumni, faculty, staff, and programs. 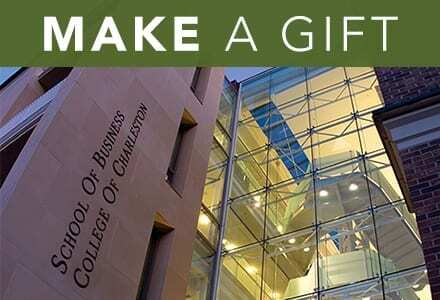 The College of Charleston School of Business has more than 3,000 students enrolled in ready-to-work programs including nine undergraduate majors, 10 minors and six concentration areas, an Honors Program in Business, and master’s programs in business and accountancy. The School of Business is recognized among the top 30 colleges for studying business abroad by the Business Research Guide. It has several Centers of Excellence and initiatives that support specific industries, conduct research and help to strengthen ties with the global business community. The Centers and initiatives also advance the educational experience and understanding of business students in a variety of specialty areas, including real estate, entrepreneurship, global business, economics and tourism. Visit www.sb.cofc.edu to learn more about the undergraduate, graduate and professional programs, faculty, and Centers of Excellence in the School of Business.